We offer our client an excellent quality range of Seed Pouches, which are manufactured from high grade quality raw materials. These Agrochemicals and Pesticide Packaging Pouches can be customized as per our precious customers specifications. 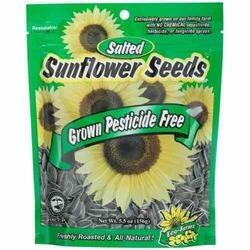 These Agrochemicals and Pesticide Packaging Pouches are widely known for its durability and quality. Our Agrochemicals and Pesticide Packaging Pouches can be availed at industrial leading price. Our forte lies in offering our clients with Seeds Pouches that are designed under the strict vigil of our professionals. We make sure that these pouches are durable and exhibit good resistance against tear. These have excellent maintainability & seal strength and dart impact. Looking for Agricultural Pouches ?